This dramatic pair of interacting galaxies are located in the southern constellation Fornax (The Furnace). The largest, NGC 1316, is also known as Fornax A, meaning it is the brightest radio source in Fornax (also the fourth brightest in the entire sky). The strong radio emission originates from its central supermassive black hole. The halo of the galaxy is very distorted and shows many prominent tidal tails and swirls of stars which have likely been ejected by a previous merger event. The next collision appears to be lining up already, with the smaller elegantly shaped spiral companion NGC 1317 already appearing somewhat disturbed by the pull from its more massive neighbour. A few billion years from now it will likely have been completely devoured by NGC 1316; its stars being spread throughout the realms of the large elliptical and leaving no trace of their former orderly spiral structure. Our own Milky Way galaxy will likely share this fate in the future when it collides with the Andromeda Galaxy. Although the large Andromeda Galaxy is approaching our own galaxy with the colossal speed of 110 km/s the two galaxies will not begin to merge for another 4 billion years. 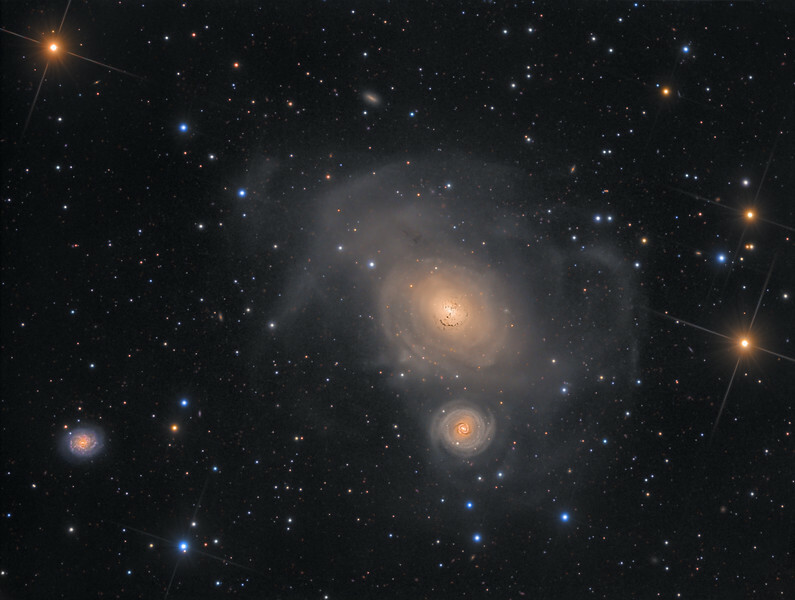 For some reason this beautiful pair of galaxies is rarely imaged by amateurs. Some detailed images exist of this pair taken by large observatories including a very detailed close-up from the Hubble Space Telescope. I was pleasantly surprised by the high level of detail acquired in the central dust streaks in front of the bright core (see the HST image for comparison). Also the many distant reddened background galaxies that litter the entire FOV are a nice addition to the galaxies, with some even shining through the distorted halo of NGC 1316. The current best distance estimates place NGC 1316 approximately 62 million light-years from us, and so the light recorded here in this image actually left the galaxy only shortly after the Cretaceous–Tertiary (K–T) extinction event that killed the dinosaurs some 65 million years ago.